Vancouver based Saturna Green Systems will launch an electric scooter share at UBC in June, and if the city approves its plans, in Vancouver this fall. Vancouver based Saturna Green Systems to 'test' up to 100 scooters at UBC this summer. A Vancouver company says it will launch electric scooter sharing in the city, beginning with 50 to 100 scooters at the University of British Columbia, likely in June. The UBC scooters will be a trial run with the company's target customers — young adults — with a plan to expand the service across the city with up to 300 scooters — an expansion that would require city approval. "We want to be sure that everything works properly before ... we deploy the service in all of downtown Vancouver," said Marco Parlato, marketing manager for Saturna Green Systems, the company behind the scooter sharing service. The final details are still being worked out, Parlato says, but the plan is to charge users a $15 monthly fee and 25 cents per kilometre to use the scooters. It will be a one-way service, with no time limits. A user picks up the scooter and rides to their destination. When they log out of the on-board computer display, another user can find and use the scooter via an app. "We want our users to have a really relaxed and fun scooter ride, so we will charge per kilometre," said Parlato, who suggests charging for distance rather than time could prevent users from speeding to a destination. The company says it is working on a plan that would allow users to "hold" their scooter if they are running an errand or stopping for a cup of coffee. The scooter's battery should last 50 kilometres before it needs a charge, Parlato says, and users who park the scooter at a charging station would be rewarded with free kilometres. "But in case there is a scooter left with, I don't know, 10 per cent battery on the street, we have a rescue team that actually goes and swaps batteries or brings the scooter back," Parlato said. The plan is for users to use their own helmet, Parlato says. "When a member will join the service, he will also get a helmet. So hopefully every member will have his own helmet," said Parlato. The company will also equip each scooter with "one or two helmets" in a lock box for emergencies, along with disposable hair nets for "hygienic purposes," Parlato said. Unlike many of the electric scooters currently found in the city, the Saturna Green scooters will require a driver's licence and must be driven on the road. They will be banned from using bike lanes. 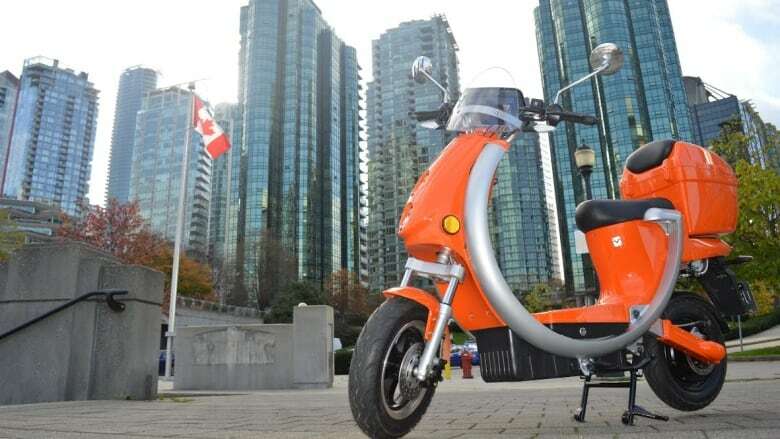 The scooters have a top speed of 45 km/h and have been designed to conform to a European standard, Parlato said, as the service will be tested in London at the same time as Vancouver. The city is aware of the scooter sharing plan and city staff are involved in testing the scooters and giving their feedback as part of the City of Vancouver's Green and Digital Demonstration Program. But it's far from certain the scooters will be zipping along Vancouver streets this fall, as the company has yet to apply for a business licence, or parking spaces. The city would have to approve both, before the company could operate, said a statement from city staff.